Dr. Charles Aubeny, a professor in the Zachry Department of Civil Engineering at Texas A&M University, has produced a new guidebook on groundbreaking geotechnical research titled Geomechanics of Marine Anchors, creating a reference of knowledge based on the construction of offshore anchors for floating structures. Dr. Jeffrey Otey, an instructional assistant professor with the Zachry Department of Civil Engineering at Texas A&M University, is teaching new and innovative visualization courses that aim to open a new dimension of engineering design for students. Recently a group of 12 Texas A&M University nuclear engineering graduate students from the Texas A&M Engineering Experiment Station (TEES) Nuclear Security Science and Policy Institute (NSSPI) traveled to Tennessee to participate in a short course in non-destructive assay (NDA) techniques. States. Dr. Ploy Charoenphol, research assistant professor with the Department of Mechanical Engineering at Texas A&M University, is working to help reduce that statistic, and has recently received a grant to aid her in that endeavor. Currently, researchers at the Center for Research and Advanced Studies of the National Polytechnic Institute (CINVESTAV) are actively working to revive a stretch of mangroves along the western coast of Yucatan within the Rio Celestun Biosphere Reserve. Doctors use a wide variety of imaging techniques to diagnose diseases. One such technique includes optical coherence tomography (OCT), which is a noninvasive medical imaging tool that has helped doctors accurately diagnose pathologies in cardiology, optometry and ophthalmology. Graduate students Amir Tofighi Zavareh and Oscar Barajas, along with Dr. Sebastian Hoyos, associate professor in the Department of Electrical and Computer Engineering, have developed a new generation of OCT processing technology that will help doctors perform OCT tests faster and make a more accurate diagnosis. With virtual and augmented reality, the world is poised to become a safer, more practical place. 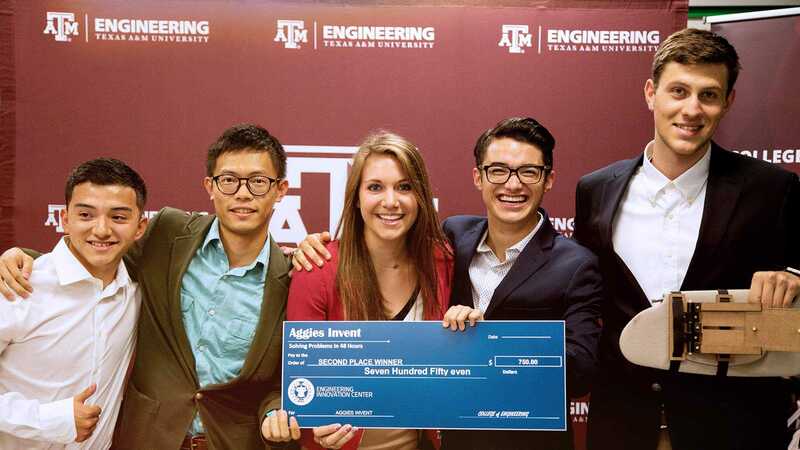 And if you ask any of the 56 students who participated in the most recent Aggies Invent, an intensive design experience offered at the Texas A&M Engineering Innovation Center, they’ll tell you the world will be a more exciting place as well. Dr. Bobak Mortazavi, assistant professor in the Department of Computer Science and Engineering at Texas A&M University, is working on a project to develop medical sensors that produce data for tracking risk factors for various cardiovascular diseases, such as heart attacks and heart failure. Saurav Agarwal, doctoral student, and Dr. Suman Chakravorty, associate professor, from the Department of Aerospace Engineering and The Estimation Decision and Planning Lab at Texas A&M University have developed an indoor mapping technology that allows autonomous robots to be deployed in extremely large-scale environments (e.g., Amazon warehouses that are millions of square feet in size) at an affordable cost. On Nov. 2, 2017 the Zachry Department of Civil Engineering at Texas A&M University hosted its annual banquet honoring recent donors of endowed scholarships or fellowships, recipients of former student awards and students who were awarded scholarships or fellowships. Graduate students from the Master of Industrial Distribution (MID) program at Texas A&M University recently visited Poland as part of a global distribution course that involves experiential learning with live projects. This fall, researchers from the Department of Aerospace Engineering at Texas A&M University teamed up with Siemens to develop manned aircraft completely powered by electric propulsion systems. Dr. M.M. Faruque Hasan, assistant professor in the Artie McFerrin Department of Chemical Engineering, has been awarded an American Chemical Society Petroleum Research Fund (ACS PRF) Doctoral New Investigator Award for research that could benefit the entire energy sector and the natural gas industry. Almost 200 students, faculty, staff and alumni filled a packed room in Texas A&M University’s Rudder Tower for the 2017 Ray Rothrock Lecture Series presented by the Department of Nuclear Engineering at Texas A&M. The presentation, titled “The Future of Nuclear Energy: Challenges and Opportunities,” included a series of presentations by renowned individuals from national labs and the nuclear industry, as well as a question and answer panel. This fall, Julien Bauer, a petroleum engineering master’s student, and his French team members won first place at the International Gas Forum of St. Petersburg competition. Twelve students from the Department of Computer Science and Engineering at Texas A&M University participated in the Association for Computing Machinery (ACM) International Collegiate Programming Competition (ICPC) South Central USA regional competition, held Nov. 4. Texas A&M University aerospace engineering professor Dr. Bonnie J. Dunbar was elected president of the Association of Space Explorers (ASE) International at the 30th annual ASE Congress in Toulouse, France, on Oct. 20. She is the first woman to be elected ASE president. For engineering students in search of humanitarian work while studying abroad, Engineering Rwanda offers both and more. Texas A&M University has been named the recipient of two grants from Texas Governor Greg Abbott’s Governor’s University Research Initiative, a program aimed at bringing the best and brightest researchers in the world to Texas. Dr. Roderic I. Pettigrew, a physician-scientist and internationally recognized leader in biomedical imaging and bioengineering, will join Texas A&M to lead Engineering Health (EnHealth), the nation’s first comprehensive educational program to fully integrate engineering into all health-related disciplines. Dr. M. Cynthia Hipwell, also a National Academy of Engineering member, has joined the Department of Mechanical Engineering as a Texas A&M Engineering Experiment Station Distinguished Research Professor. Dr. Cynthia Hipwell has been named one of the beneficiaries of Texas Governor Greg Abbott’s 2017-18 Governor’s University Research Initiative (GURI), a program aimed at bringing the best and brightest researchers in the world to Texas. Texas A&M University’s Department of Mechanical Engineering rose in undergraduate rankings compared to other public institutions according to the 2018 U.S. News & World Report Best College Rankings. Dr. Dmitri Loguinov, a professor in the Department of Computer Science and Engineering at Texas A&M University, was recently awarded a grant from the National Science Foundation for his work centered on high-performance virtual-memory streaming. Blake Williford, a doctoral student in the Department of Computer Science and Engineering and member of the Sketch Recognition Lab (SRL) at Texas A&M University, earned first place at the CHI PLAY 2017 student game design competition for the game, "ZenSketch", which he created with fellow SRL graduate students Matthew Runyon and Adil Hamid Malla. Dr. Dilma Da Silva, department head, professor and holder of the Ford Motor Company Design Professorship II in the Department of Computer Science and Engineering at Texas A&M University, was named interim deputy director of the Texas A&M Institute of Data Science (TAMIDS). There are many ways to show the Aggie spirit. Sam Tomaso, senior in the Zachry Department of Civil Engineering, shaves the number 12 onto his chest for home football games, gaining him the nickname 12th Man Jesus. More than 100 power systems experts, utility operators and vendors from across the globe gathered at a conference and workshop organized by representatives from Texas A&M University to discuss how big data and intelligent systems are revolutionizing the power grid operation in a competitive environment with a high penetration of renewable energy. Exploring a different culture and country while learning mechanical engineering at the same time, that’s what this study abroad program can offer students through its six-week summer program in Spain. The Texas A&M University student chapter of the American Concrete Institute (ACI) recently took the egg drop test to the next level by placing 12th worldwide in the ACI’s international concrete competition of egg protection devices. Dr. Roderic I. Pettigrew, a physician-scientist and internationally recognized leader in biomedical imaging and bioengineering, will join Texas A&M University to lead Engineering Health (EnHealth), the nation’s first comprehensive educational program to fully integrate engineering into all health-related disciplines. 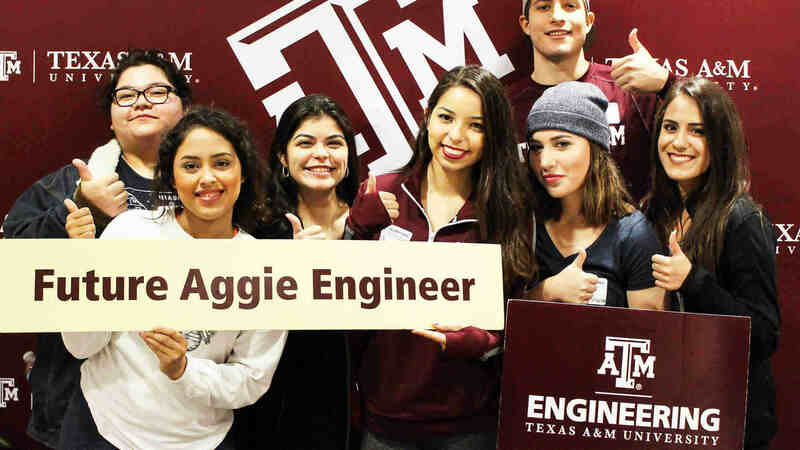 Texas A&M University’s Engineering Honors recently held it’s first Undergraduate Research Showcase & Opportunities Fair for all undergraduate members. Students were encouraged to learn about the research of their fellow scholars and be inspired for their own research that is required for Engineering Honors students and learn about research opportunities that are available to all undergraduate students. In September Dr. Jodie Lutkenhaus, associate professor and holder of the William and Ruth Neely Faculty Fellowship in the Artie McFerrin Department of Chemical Engineering at Texas A&M University, delivered a lecture at the Japanese-American-German Frontiers of Science Symposium in Bad Neuenahr, Germany. Alfredo Costilla-Reyes, a graduate student in the Department of Electrical and Computer Engineering at Texas A&M University, has been named recipient of the Mexico National Youth Award, the highest award presented by the Government of Mexico to the country’s youth. Faculty members, students and a former student of the Harold Vance Department of Petroleum Engineering at Texas A&M University were among those awarded at the Society of Petroleum Engineers (SPE) Annual Reception and Banquet in San Antonio, Texas on Oct. 10. Dr. Scott Socolofsky, professor in the Zachry Department of Civil Engineering, joined principal investigator Dr. Kristen Thyng and other researchers from Texas A&M’s Department of Oceanography to study how Galveston Bay and the coastal Gulf of Mexico responded to the extreme amount of freshwater that poured into the gulf from rainfall and runoff from the Houston area. Engineering students were honored and donors recognized at the Texas A&M University College of Engineering Student Awards banquet Oct. 26. Dr. Astrid Layton, assistant professor in the Department of Mechanical Engineering at Texas A&M University, is researching whether companies can apply a similar concept of how this natural network looks and behaves in an effort to create more sustainable networks of industries. It’s no secret to anyone that Texas is hot and that with heat comes drought. Across the more than 269,000 square miles that make up the state, many Texans constantly fight cycles of drought or flooding season after season. In these places, good water management is essential and thanks to new research by Dr. Gretchen Miller in the Zachry Department of Civil Engineering at Texas A&M University, getting clean water to communities that need it most may now be easier and more cost-effective than ever.